While this blog will probably mostly be about Shanghai, the city where I normally reside, it just so happens that I suddenly developed the drive to start it right before a week-long trip to Singapore. And so that’s where I’ve been this weekend! I actually used to live in Singapore in the 1990s. My memories aren’t super strong of my time here. I remember it being really hot and humid (and it still is, but miraculously it is about a dozen degrees cooler than Shanghai this July - #heatwave #hellpocalypse). I remember random things like splashing around in a rocky water park area at the zoo, or busting up chins and shins running around pools, or going to that one crazy theme park with a ride through several levels of Chinese hell, or releasing a pet rabbit into the Botanical Garden (note: don’t do this. my parents didn’t know better back in the 90s, but that is not how you should get rid of unwanted pets). When I came back in the mid-2000s, I admit I didn’t have the best impression. Singapore, to me, felt boring, bland and basic. I remember walking between shopping malls and wondering if this is all Singaporeans did. I remember looking around Clark Quay, eyes glazing over at how unimaginative everything seemed. I remember thinking Singapore was basically Hong Kong, if Hong Kong was scared of character. I'm not saying this was fair, btw. It's just how it looked to me then. But something changed between then and last year, when I began coming here for work. I did a double take the first time I walked down Grange Road, because one thing I don’t remember Singapore being was so GREEN. The first one that made my jaw drop was the Park Royal Hotel on Pickering. Designed by WOHA, it’s a complex of undulating blue glass and foliage dripping from every open cranny. It looked like a render of how a techno-futurist would depict utopia. And it wasn't the only one around. This is now trip number three in about a year, and I still find myself in awe of just how many there are here! They are now all over the place, skyscrapers bursting with hanging gardens nestled amongst the colonials and the blocky "pragmatic government tan” buildings of the past. After a little research, it seems this sky garden explosion got its start in 2005 with the establishment of Singapore's Green Mark standard, which offers a whole bunch of generous incentives around sun-shading exteriors, water efficiency, carbon emissions reductions and high-tech energy and cooling systems. It even offers financing for retrofitting existing buildings with energy conservation technologies. Note: Yes, a skygarden doesn't mean the building is "green." But in this case, the aesthetics actually match the intent! Singapore is now in the lead to have the most “green" buildings out of any city in the world - architecture and real estate firms reported in 2013 that two out of every three new projects are in developing green buildings. The city-state's Green Mark standard is a direct competitor to LEED (which offers similar certification, but tends less to be specifically about energy and water conservation), and has already begun being exported to other countries around South East Asia. A mall designed on the "theme of nature" by Benoy, and winner of environmental awards by Singapore's BCA. Designed by WOHA, this hotel is one of the first and tallest "living green structures"
Also designed by WOHA, it has an extensive green roof and green facade to help keep the school cool without air conditioning. 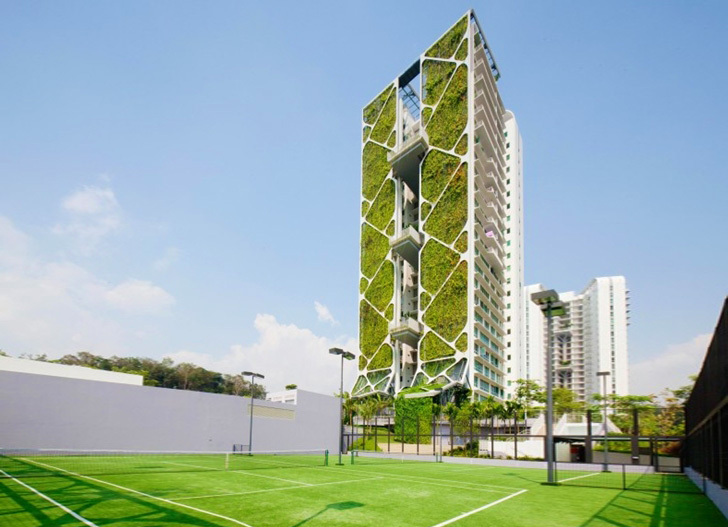 A condo complex that set the Guinness world record for the largest vertical garden in the world. The contrarian Marxist in me wants to say something about how a true sustainability model probably shouldn’t be so dependent on what is essentially a free flow of capital (and one that is predicated on something as unstable and finite as the growth rates of India/China). The rest of me wonders if this just means I’ve been spending too much time around left-bookers from decaying countries too much, because Singapore is one of those weird socialist-capitalist hybrid states and a markedly better way for the future than the current nightmare of the United States. Like, can you imagine if Chris Christie was as dedicated to turning NJ into a “Garden State” as Singapore was about living up to the moniker “Garden City”? And in the meantime, it's reformed a Singapore critic. However snobby I want to be about this place's fear of grittiness, I've got to say that now Singapore looks pretty damn cool.